Notes: This set marks the beginning of the end for A&BC Chewing Gum. While I'm not sure of the details I suspect that the relationship between the original A&BC directors and their Topps co-directors was not going well. Litigation, and for A&BC ultimately closure, was less than two years away. The Blue backs were issued as two large series, each of 131 cards, though there were obviously production problems with certain cards and checklists. The cross-promotion with Topp's Bazooka Joe bubble gum wrappers has been dropped in favour of offers for A&BC Footballer wrappers. Each wrapper included a 'special offer' to purchase merchandise with a small amount of money and 5 wrappers. 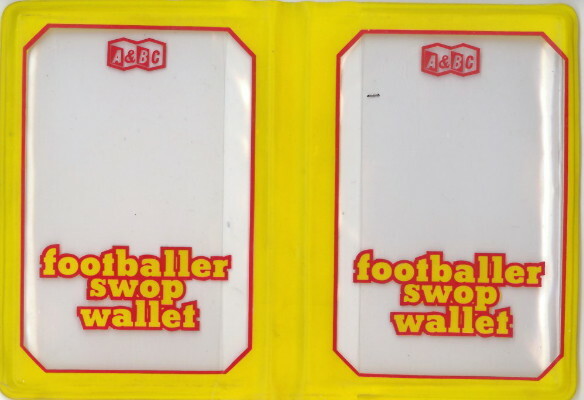 If you ordered one of the 'gifts' then you also received an A&BC footballer swop wallet. The wrappers that I know about are shown below (with thanks to Barry who provided most of these images). If you know of other wrappers or offers please email me here. 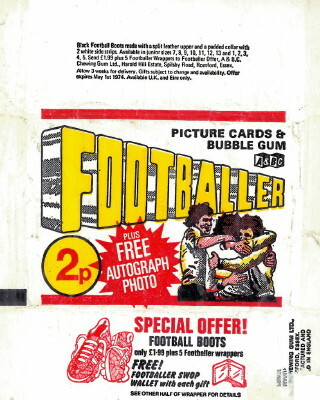 The offers could be redeemed by sending to Footballer Offer, A&BC Chewing Gum Limited, Harold Hill Estate, Spilsby Road, Romford, Essex. Football boots - only £1.99 plus 5 Footballer wrappers. Black Football Boots made with a split leather upper and a padded collar with 2 white side stripes. Available in junior sizes 7, 8, 9, 10, 11, 12, 13 and 1, 2, 3, 4, 5. 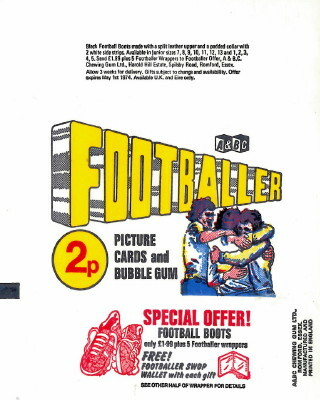 Send £1.99 plus 5 Footballer wrappers to Footballer Offer, A&BC Chewing Gum Limited, Harold Hill Estate, Spilsby Road, Romford, Essex. Allow 3 weeks for delivery. Gifts subject to change and availability. Offer expires May 1st 1974. Available U.K. and Eire only. Known as an offer with: Series 1 and 2.